Architects are well known for the clean and sophisticated style, but every so often they like to throw a curve ball when it comes to their wardrobe. 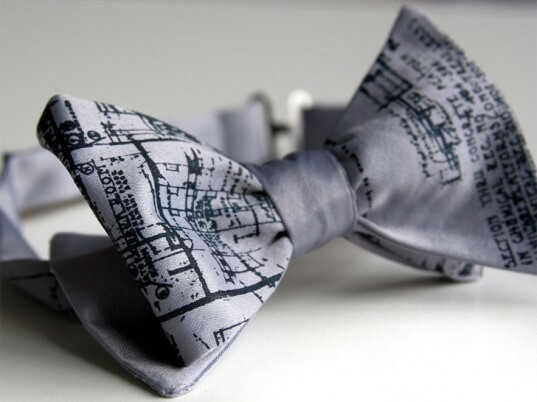 Digitally restored from real-life 1917 blueprints by William E. Higginbotham and William G. Malcomson, these uber stylish bow ties trace the outline of Detroit’s Cass Technical High School. Available in black, silver, and cream, each tie is made from vegan-friendly microfiber and hand-printed with nontoxic, water-based inks. So if you’re designer looking to give his or her outfit an extra bit of oomph at the latest exhibit opening or lecture, nab this simple accessory and get all your colleagues to peer through their thick-rimmed glasses with envy! Architects are well known for the clean and sophisticated style, but every so often they like to throw a curve ball when it comes to their wardrobe. Digitally restored from real-life 1917 blueprints by William E. Higginbotham and William G. Malcomson, these uber stylish bow ties trace the outline of Detroit’s Cass Technical High School. Available in black, silver, and cream, each tie is made from vegan-friendly microfiber and hand-printed with nontoxic, water-based inks. So if you're designer looking to give his or her outfit an extra bit of oomph at the latest exhibit opening or lecture, nab this simple accessory and get all your colleagues to peer through their thick-rimmed glasses with envy!